The 2017-18 slate of college football bowl games is upon us, and with that, some interesting matchups across the nation. College football fans get their last looks at their teams for the year, while NFL fans can potentially get their first viewing at some top draft-eligible players their favorite team may take in the 2018 NFL Draft. 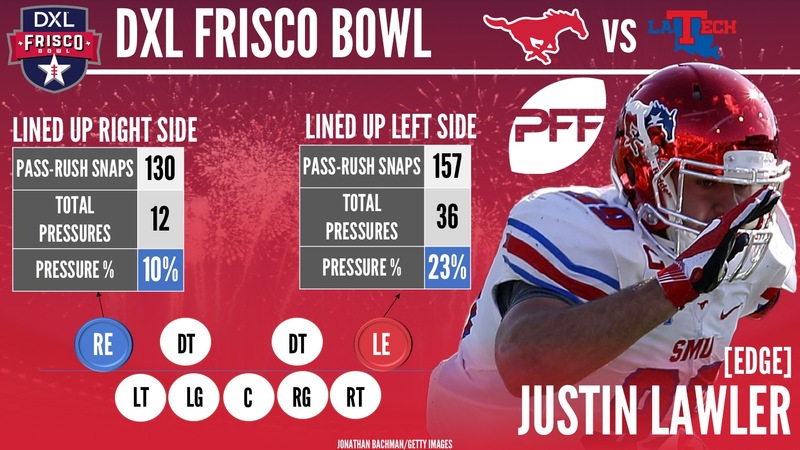 With the games as sporadic as they are during bowl season, we at PFF have split the games up into weeks, and will give you a preview of every bowl game’s top draft-eligible players to watch. 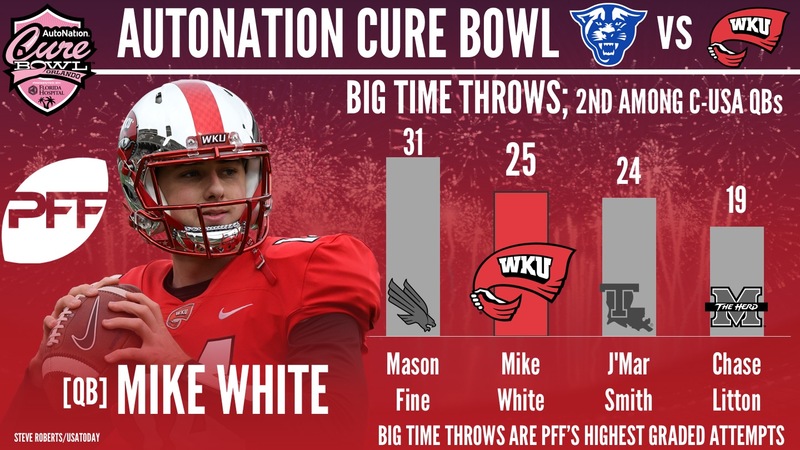 Be it a quarterback, a cornerback, anyone on the interior at the line of scrimmage and all in between, PFF’s Draft Team has you covered on who to watch, with eyes on the 2018 NFL Draft. Weatherspoon was one of the most avoided cornerbacks in all of FBS in 2017. He was targeted once for every 16.3 coverage snaps which ranks first among all draft-eligible FBS cornerbacks. Weatherspoon only allowed 12 catches on 17 targets for 140 yards and only one touchdown while adding two interceptions. Jenkins measured in at just under 5-foot-9 and 180-pounds in the spring, but his lack of size has not prevented him from completely locking down the competition this year. He’s been targeted 39 times in coverage in 2017, and has given up just 14 grabs. 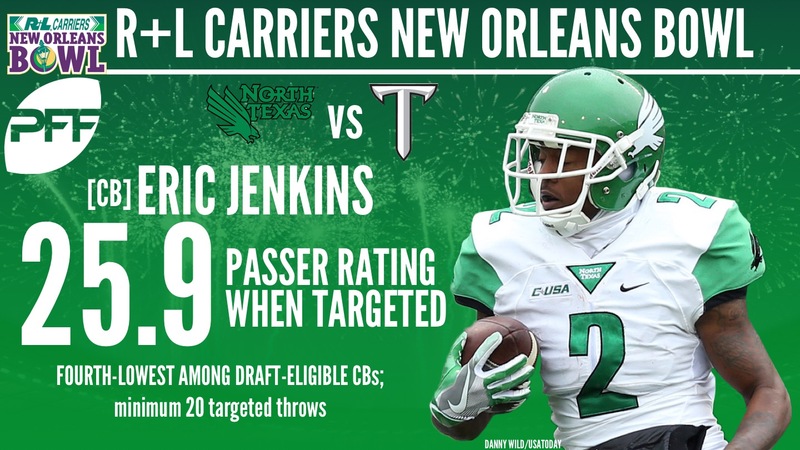 Jenkins has two interceptions and six pass breakups, and his 25.9 passer rating when targeted ranks fourth among all cornerbacks with at least 20 throws into their coverage this year. White was firmly on our radar heading into the season, as he finished 2016 ranked first in deep accuracy percentage. While this year has been a struggle at times, adjusting to a more conservative passing offense with largely new faces, he still has managed a passer rating of 118.1 on deep throws. His efficiency from a clean pocket has also been outstanding, as he ranks fifth among draft prospects with 200-plus attempts in adjusted completion percentage when not threatened by the rush. Saturday won’t be the last time we see Sullivan wearing his college helmet, as he has already accepted an invitation to the Senior Bowl in January. For the season he’s surrendered just 26 receptions on 48 throws into his coverage, and did not give up more than 30 yards receiving in any of the past six games. Crosby leads all tackle prospects this year in pass blocking efficiency, as he has yet to surrender a sack or a hit and is responsible for just three total pressures against. He also has a run blocking grade of 84.3, making him one of the most impressive tackle prospects in the country in terms of all-around production. Freeman’s best year was his sophomore campaign of 2015, when he forced an incredible 80 missed tackle on 283 rushes. His play dipped a bit in 2016, but he was back to his elusive ways this year with 50 missed tackles forced on rushes. That ranked fifth among running back prospects with at least 150 total touches in our elusive rating, and considering his body of work and size, he is a legitimate Day 2 prospect for this year’s draft. 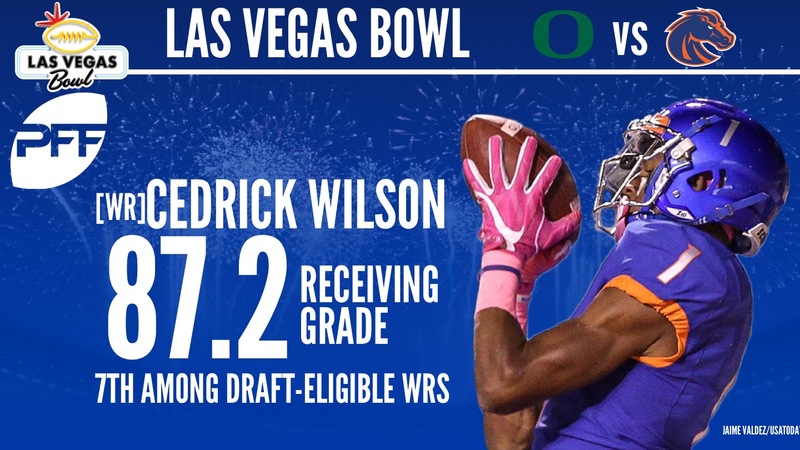 He will not play in the Las Vegas Bowl, but he’s a name to remember. Springs has been one of the most productive Pac-12 cornerbacks all year, posting 14 pass defenses while giving up completions on just 23-of-55 throws into his coverage. 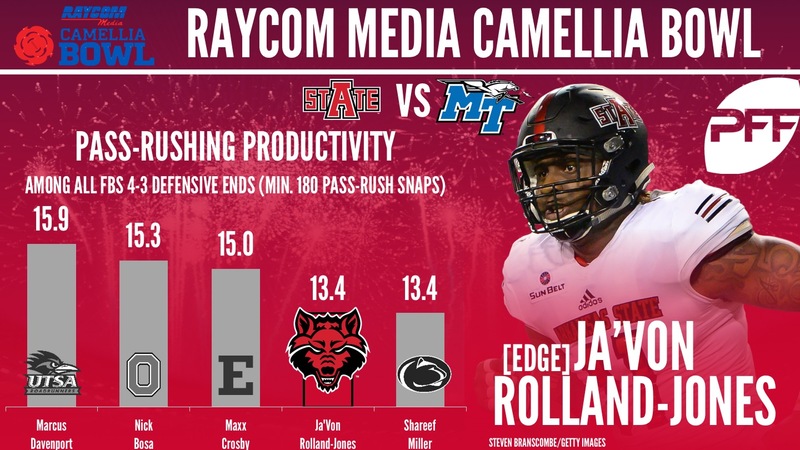 His 16.9 coverage snaps per reception allowed ranks second among seniors in the conference, and his 6-foot, 205-pound frame is sure to excite NFL scouts. Hollins has flashed periods of dominance on the pass-rush this year, as evidenced by his eight pressures against Utah and three sacks against Cal. His run play has been the most consistent part of his game, as he ranks 10th among senior 3-4 outside linebackers in run stop percentage. Wilson was one of the highest graded receivers in the country last year, and 2017 has been no different, as his 87.2 receiving grade ranks him No. 7 among draft-eligible players at the position. He finished the season with a flurry of explosive plays, as he posted individual receptions of at least 39 yards in each of the last five games. Frazier is another excellent all-around edge prospect in this game, as he posted eight sacks and eight QB hits this season, and ranks 10th among draft-eligible 3-4 outside linebackers in pass-rush productivity. Even more impressive is the fact he has missed just one tackle this season, helping him rank fourth in tackling efficiency among prospects at his position with at least 400 total snaps. Vander Esch has been a run-stuffing machine this year, as he has posted a total of 46 run stops. That has helped him secure the No. 2 slot in run stop percentage among inside linebacker prospects. 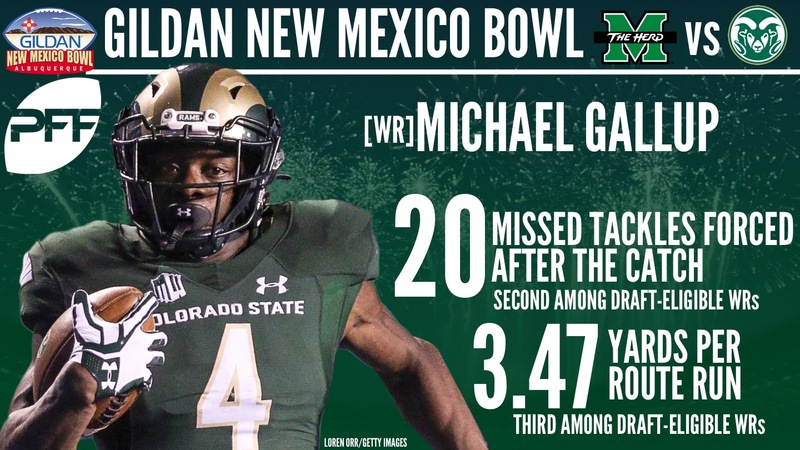 Gallup is certainly one of the headliners this week, as he is the highest-graded receiver in the country this year, regardless of class. His 20 forced missed tackles after the catch ranks second in the draft class, and 3.47 yards per route run average ranks third. Hancock flashed the ability to be productive in a variety of areas, as evidenced by his 16 total pressures, six of them coming against Western Kentucky. His 89.5 overall grade ranks fifth among all linebacker prospects this year. Few, if any, edge rushers have been as consistently productive over the past four seasons as Rolland-Jones. He has tallied at least 11 sacks in each of his four years at Arkansas State, topping out at 17 in 2016. This past season, he had 14 sacks and 49 total pressures, helping him rank third in pass-rush productivity among 4-3 defensive end prospects. In the middle of the season, he had a torrid four-game stretch in which he ripped out nine sacks, three hits and 19 hurries. Unfortunately, James broke his collarbone in October, ending his season. He’s a name to remember for the draft process, as he could be a Day 2 selection (he combined for 211 catches and 42 forced missed tackles after the catch in 2015 and 2016), but we won’t see him in action this weekend. Stockstill struggled through injury issues of his own this year, but he was one of the top producing quarterbacks in the country in 2016. Among 2018 draft-eligible prospects last year, Stockstill ranked second in adjusted completion percentage (57.8) and passer rating (134.0) on deep passes. Woods has been among the top-graded centers in the country all season, as he has excelled in both pass protection and on run blocks. He has surrendered no sacks and just five total pressures in 2017, and his 87.3 overall grade ranks third among center prospects for this year’s draft. George is just a junior, but has been a top producer for the Zips this year. He has tallied five interceptions and four pass breakups, and has surrendered a reception of 20-plus yards just once in 2017. In a loaded receiving corps, Quinn surprisingly emerged as the go-to target this year for QB Ben Hicks, as he ranked third in the country in targets and first in receptions. His 91.1 overall grade ranks second behind on Gallup, and his 1.89 percent drop rate is the best in FBS. Sutton is a huge target at 6-foot-4, 215-pounds, but has also shown surprising elusiveness by forcing a combined 23 missed tackles the past two seasons. In his three years as a starter, he has collected 31 total touchdowns, and is certainly in play on Day 2 of the draft. In terms of pass-rush productivity, no edge player this season has been more consistent on the left side. Lawler has amassed 54 total pressures, 36 of them coming on 157 rushes off the left edge. In his three years as a starter, he collected 122 total defensive stops, with his 44 from this year being his high-water mark. Scott is another hyper-elusive back, as he frustrates defenders with his explosive jump-cutting ability. He has collected 45 forced missed tackles on 180 touches this year, which ranks him fourth among all running back prospects in elusive rating.